Let’s face it: We use the holiday as an excuse to eat a colossal amount of sugary treats. With Halloween right around the corner, it’s easy to get swept up in the sweet and the sour. I’m going to be the first to tell you – candy isn’t the only option. There are a bunch of alternatives and some of them are even semi-healthy. Here are some substitutes to satisfy your sweet tooth. Halloween Oreos may just be my favorite treat – not just for the 31st, but for all of October. The delicious orange filling sparks my holiday spirit and fulfills my deep sugary craving. Plus, the ghoulish designs on the cookies are pretty neat. In no way am I saying Oreos are healthy, but they definitely aren’t candy. Grab a glass of cold milk and enjoy your newly discovered chocolate crumb mustache. This is a more health-conscious alternative to candy, depending on your favorite mixture. Trail mix, or gorp, typically contains nuts. Peanuts, almonds and cashews contain a high amount of healthy fats. 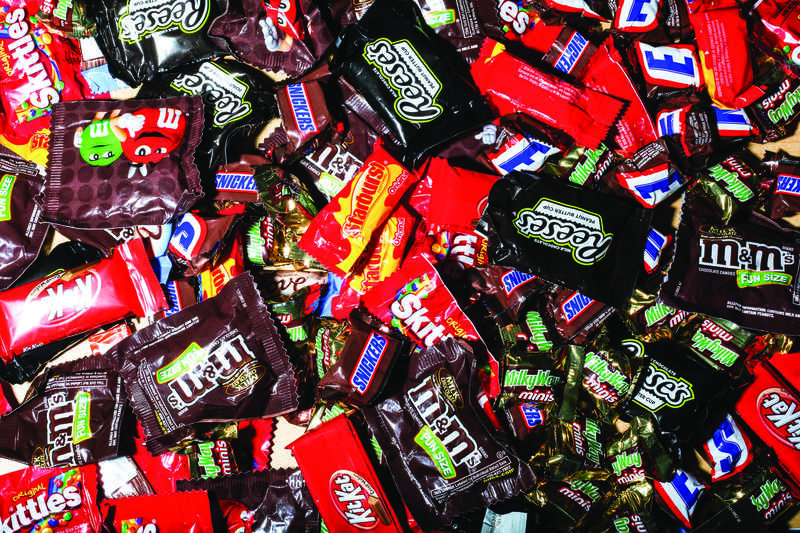 If giving up candy entirely doesn’t sound appealing, try a mix with chocolate or dried fruit. Most blends throw in some sort of sweet as a perfect complement to the salty nuts. You can even make your own Halloween blend with Reese’s Pieces for color or little candy pumpkins. Popcorn might not sound like the perfect Halloween snack, but don’t knock it until you try it. The Cracker Jack brand has been around since forever. Not really, but it has been around for a long time. The original, caramel-coated popcorn and peanuts, is especially tasty and ideal for your seasonal horror movie nights. The real kicker: Cracker Jacks are vegan. You probably don’t consider beverages as a replacement for candy, but maybe you should. Juice contains a lot of sugar and isn’t necessarily a healthy alternative, but it tastes nice and adds variety to your sugary diet. I suggest you try Capri Sun. It’s a real crowd pleaser for both adults and children, and there are more than ten flavors. These are my all-time favorite snack food. Not only do they come in portion-sized wrappers, but there’s also a large assortment of flavors to choose from. While some may say fruit snacks are candy, I disagree. Sure, they contain a lot of sugar and they’re processed similarly to gummi treats, but you get a lot more bang for your buck. Fruit snacks are relatively cheap and can be purchased in bulk. Plus, there are lots of brands made with real fruit juice. It’s nearly impossible to get a regular serving of greens, especially when sugar is thrown at you daily. Luckily, there are pre-packaged, microwavable cups which make eating your veggies a whole lot easier. Corn, peas, carrots and green beans are sold in single-serve containers. All you have to do is heat it. No preparation, no clean-up and a cheap option to fulfill your vegetable needs. But What about the Vegans? A lot of these treats cater to those who eat animal products on the daily. If you’re vegan, have no fear, there are options for you this month. Surprisingly, a good deal of our dearest candies are vegan. Unfortunately, these options are straight-up candy with nothing healthy about them, but they’re certainly mouthwatering and excellent for Halloween. Many of our most beloved chewy candies are vegan. Airheads, Skittles, Sour Patch Kids, Swedish Fish and Twizzlers are some of my favorite chews. If you’re unsure, merely take a peek at the ingredient list on the wrapper. Keep a close eye out on chocolate, because it might be a wolf in sheep’s clothing. Dark chocolate can easily be vegan, but most of the big name brands are not. The Chocolove dark chocolate varieties are a great pick to satisfy your craving, and they meet vegan criteria – a win-win situation. I don’t know about you, but I love sucking on sweets during class or while finishing homework. Jolly Ranchers, Lemonheads, Blow Pops and Smarties are harder candies which count as vegan sweets. They’re small, easy to carry and absolutely delicious. Besides the vegan candies, most of these aren’t great snacks to hand out on Halloween. If you do, you’ll probably have an egg or two thrown at your house. Let’s be honest, kids want candy and nothing else. They dress up specifically for a sugary reward, so your best option is to appease them. However bad for them, Halloween can still be healthy for you; try snacking on something else while you’re handing out candy this year. You might just like it.